An old-school label for the old-school 1908 Historic Pale Ale. It’s a rare day I bother to review a beer made by one of the Macro-Domestic mega-corps. I am universally uninterested in their golden lager styles and have been consistently disappointed with their beers that attempt to emulate craft styles. But, like all people too entrenched in an ideology, I was destined to be surprised, and this was achieved by the John H.R. 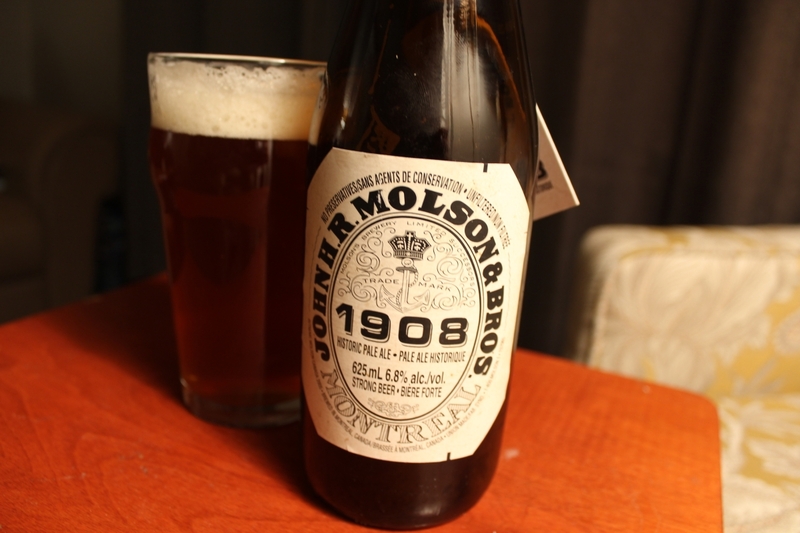 Molson & Bros 1908 Historic Pale Ale. The purity war she refers to is that of beer nerds who are committed to hating anything produced by a Macro brewery regardless of quality. While I’m not sure I fall into that category 100% (one of my favourite lagers is from Creemore Springs), I am certainly guilty of the occasional chest-beating, mouth-frothing rant against the big breweries. So, in light of this bias, I was determined to keep an open mind for the 1908 Historic Pale Ale. This limited-release beer comes from a 108 year old recipe that Molson-Coors tried to replicate as authentically as possible, even using 100 year-old fermentation techniques. It was dug out of their archives along with a number of other documents which hopefully also yield some interesting beers. 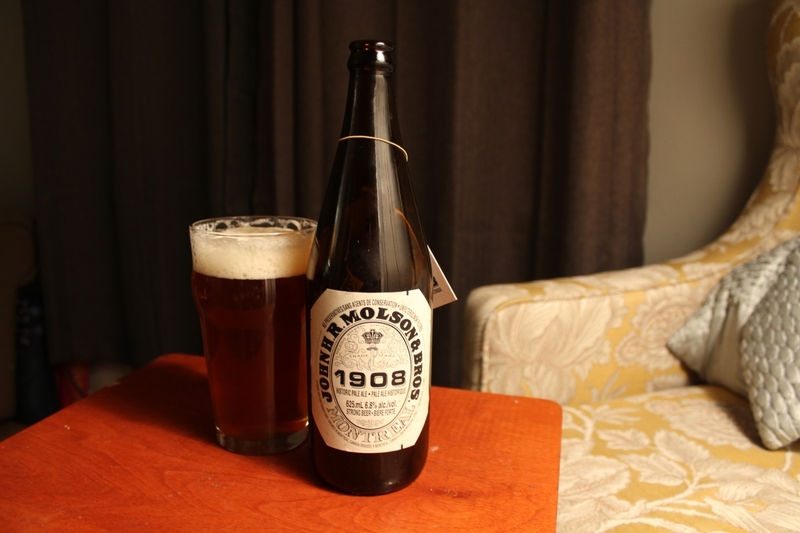 While at first I assumed the 1908 Historic Pale Ale was destined to be a gimmick, I’m happy to say it’s not — it actually shows an evolution of brewing and refinement from Molson-Coors. I never thought I’d be using the words “rich” and “flavourful” to describe a Molson product (OK last dig at them I promise), but I’m happy to amend that for the 1908 Historic Pale Ale. It pours a deep amber in the class with a fizzy, vibrant head — perhaps a product of it’s old-school fermentation. On the nose it has a warm breadiness under which there’s a bright citrus with a touch of floral perfume. Quite honestly, it smells good. The taste is pretty good too. I’d like to preface this tasting review by saying — all things considered — it’s a pretty run-of-the-mill American-style pale ale. The 1908 Historic Pale Ale doesn’t exactly push too many boundaries in terms of its style. However, with a rich caramel malt body, a touch of herbs and earthiness, floral hop tones, and a refreshing bitterness, this beer still managed to impress me. Perhaps my expectations were low. Maybe I was just really jonesing for a beer. Maybe I’m just trying to impress Robin LeBlanc. But whatever the reason, I actually enjoyed the 1908 Historic Pale Ale. There are dozens of reasons to hate on the macro breweries, but I’m pleased to say the quality of this recent release isn’t one of them. Rather than 100 years old, this beer feels like an evolution for Molson-Coors. And it’s certainly good enough to sip slow.